Sushi Doraku, Miami Beach. Custom built 1800 square foot Octopus by Rick Garcia and Bruce Hanners. From a young age, Rick was encouraged to follow his dream of pursuing and developing his talent in art. In later years he found a deep-rooted connection to surrealism, especially the work of Salvador Dali. Garcia had become obsessed with the unique images and amazing technique of the spanish painter and he eventually traveled to Port Lligat, Spain to visit the home and surroundings of his mentor. After years of attending the Art Institute of Miami, where he refined his artistic vision in drawing and painting, he was soon earning an income from published illustrations. Garcia has enjoyed a rich and diverse career starting with the hit TV show "Miami Vice" commissioning him to create a mural on the side of a three story building, and used his paintings for interior shots. Apart from a growing number of private commissions, his distinctive images were commissioned by The United Nations Postal Administration in 1998 and 2003. His stamps brought awareness to the growing extinction of the rainforest and its inhabitants, and followed with the 50th Anniversary of the World Health Organization, bringing awareness to the vanishing supply of freshwater, where it earned him the prestige of the most beautiful stamp series of 2003. Garcia was chosen as an "Absolut Artist of the 90s" in the popular vodka ad campaign and with his second piece Absolut Electric, this further drew worldwide attention. 1998, 1999, and 2001 garnered him the distinction of official artist to The Grammy Awards where his creations influenced the look of the live broadcast and graced the covers of the official program book, CDs, posters, apparel, and other various items. His work included portraits of stars such as Destiny's Child, Ricky Martin, Coldplay, Santana, Celia Cruz, Black Eyed Peas, Imogen Heap and Kanye West. His life long passion of thoroughbred racing tapped him in 2008 to be the official artist of the 2008 Kentucky Derby Festival. Founder of Benihana, Rocky Aoki, gave Rick complete creative control to design a sushi restaurant on Miami Beach. Along with sculptor Bruce Hanners, they built and installed an 1800 sq. 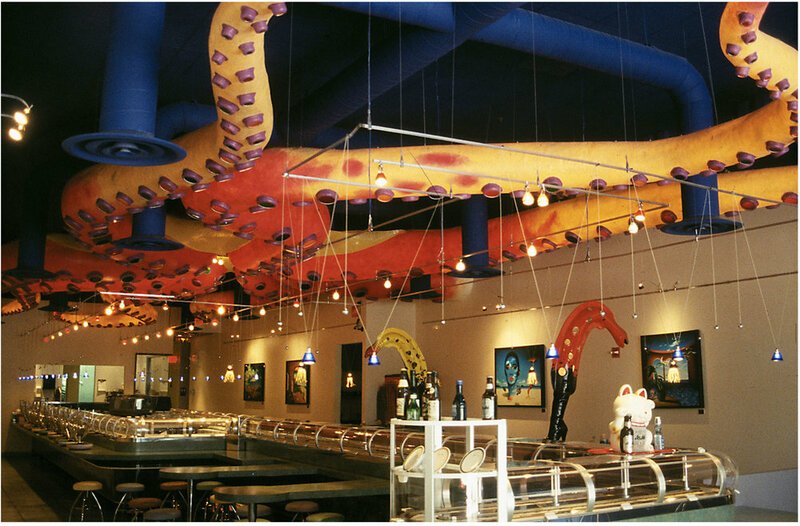 ft octopus designed by Rick to be the massive ceiling light fixture. Made of fiberglass with internal computerized lighting, it hung over this cutting edge design featuring the Japanese style of delivering fast food, "Kaiten". Other design elements included artworks and custom light fixtures throughout the restaurant including the restrooms. Rick's association with the famous Gibson Custom Shop brand spawned a collection of highly collectable one of kind painted guitars. His most recent work on guitars was painting a 1954 Gibson Les Paul reissue for The Rock 'n Roll Hall of Fame and a 50th Anniversary issue of the Gibson SG for CANCER RESEARCH U.K. Currently Rick is only taking private commissions for any further custom painted guitars.